It was a capacity crowd that convened at Sundance Headquarters on Main Street for the Hollywood Foreign Press Association’s Women Breaking Barriers: Where Are We Now? panel. The panel, which built on last year’s event, was moderated by HFPA members Elisabeth Sereda and Silvia Bizio. Panelists included accomplished women and men from various fields in the film industry including Golden Globe-winning actress Jenna Elfman, award-winning producer Cassian Elwes (Mudbound), Golden Globe-winning actress and producer Kyra Sedgwick and Golden Globe-winning actress/producer Octavia Spencer. 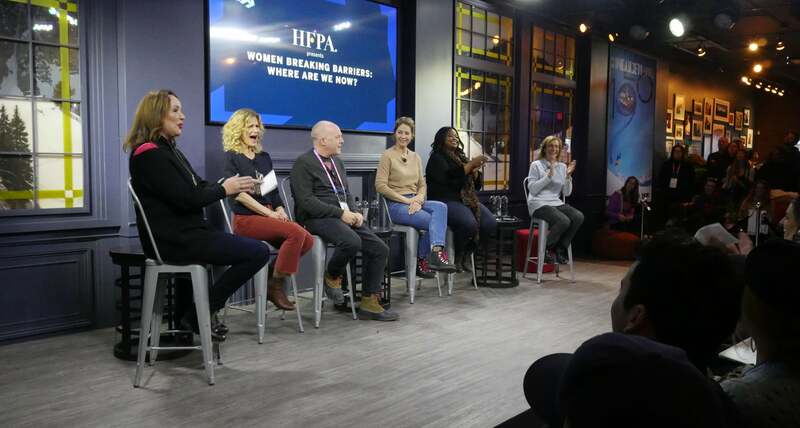 Sundance Institute’s Executive Director, Keri Putnam and HFPA member Silvia Bizio opened the panel with a brief Q&A followed by an HFPA announcement that the organization will continue to show support to the Sundance Institute’s Women’s programs by donating $50,000. To date, the HFPA has donated $100,000 to this program. The event also included an exclusive clip from the upcoming documentary This Changes Everything, directed by Tom Donahue and executive produced by Geena Davis.